Minimalism is synonymous with elegance in this simple yet innovative solution. The stainless steel finish Zeta handle is set into an L-shaped recess routed into the 22 mm thick cabinet door. The Zeta handle is designed to provide an excellent grip even with the modern Delta flat grip profile, for a stylish yet practical kitchen. Cabinet door with aluminium pull recessed along its full length. Designed to achieve a good grip and facilitate the opening of a handleless door, its shape has a minimalist style, embellishes and protects the door, but most of all it greatly improves grip thanks to its ergonomic design developed by the Armony Cucine Research & Development Centre. Materials, form and functions. The L-shaped Sigma grip profile is the key feature in this solution as it avoids the need for protruding handles and is the most practical opening system in the Armony collection. 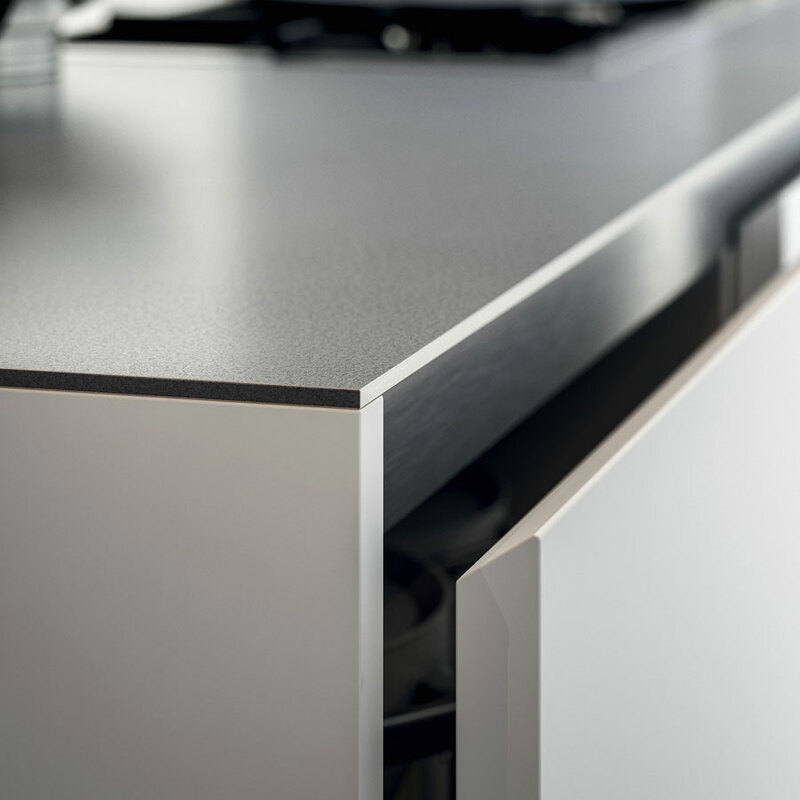 The wide space created by the grip profile improves access to cabinet doors and deep drawers and, depending on the selected finishing, can become a major feature if a strong contrast is chosen or can be toned down for a minimalist styling. This state-of-the-art solution has a clean and essential design with the top profile cut at 33°, avoiding the need for an external handle. 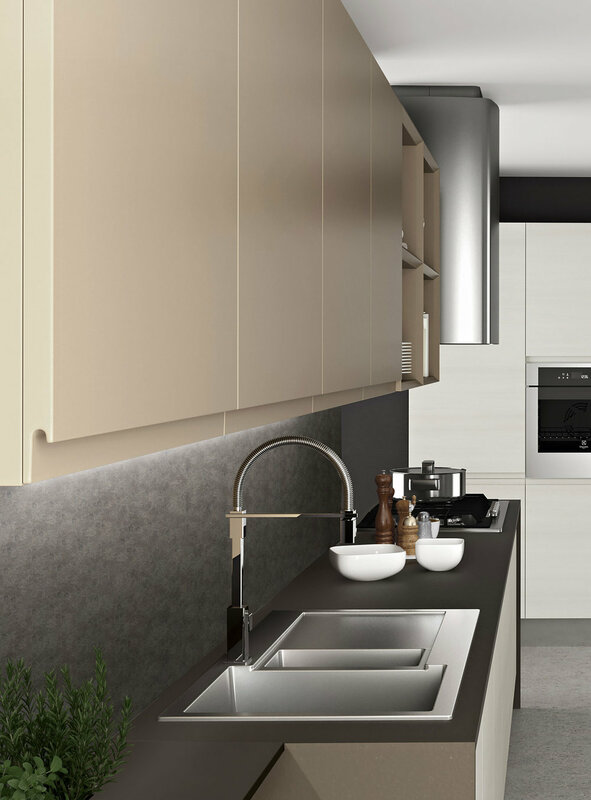 The 22 mm thick cabinet doors are manufactured with cutting-edge machinery offering a choice from a wide range of surface materials, and can be combined with Delta or Sigma grip profiles for a streamlined look in keeping with a modern kitchen design. 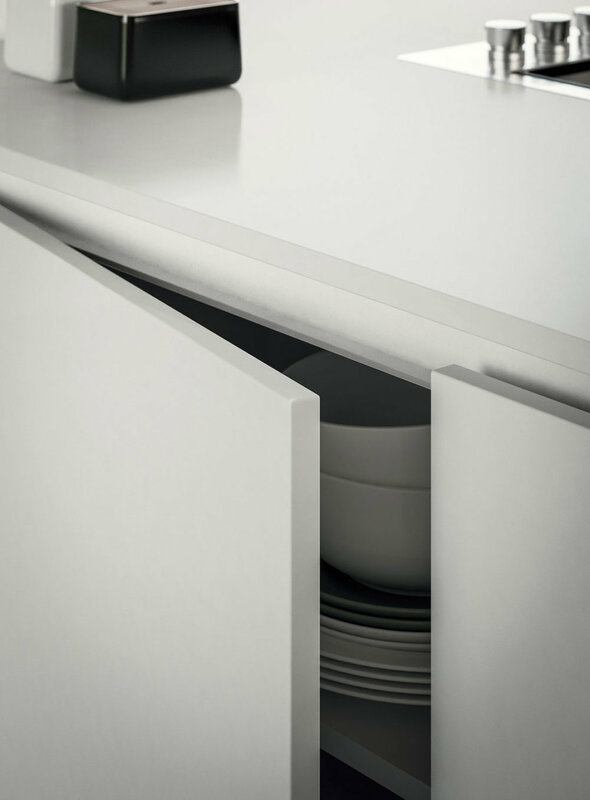 The handle is applied along the length of the 22 mm thick cabinet door and thanks to its linear and geometric shape creates modern and striking design solutions. The Regola handle is available in stainless steel and dark brown finishings to offer different aesthetic styles. The grooves are routed out of the edge of the cabinet door itself. A special manufacturing technique enables the doors and deep drawers of the Pentha kitchen to be opened without the need for grip profiles or handles, creating a sleek yet very practical overall design. In addition to the matt and gloss lacquered version, Armony also offers a wood finish version thanks to cutting-edge production processes. A practical and elegant solution featuring an internal handle recessed inside the milled door is combined with the Delta flat grip profile. 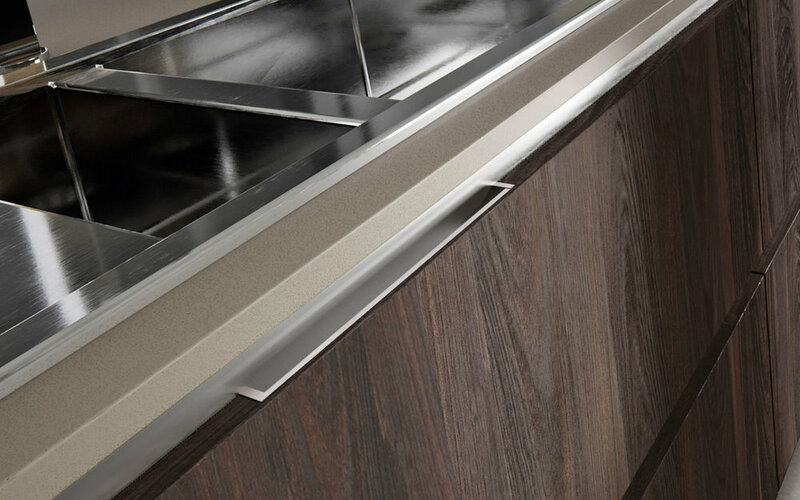 The concealed handle can be made to seem almost invisible thanks to customised finishings, available in stainless steel, dark brown, aluminium and Neveglossy lacquer. The 19 mm thick cabinet door is lowered to allow the Ola handle to be set along the length of the top edge, creating a striking motif across the whole kitchen. The visual effect of the stainless steel finishing combined with its rounded edge gives an elegant feel to the entire room. Every aspect of the Ola handle has been carefully designed, including the inside which makes it easy to grip. The harmonious and sinuous shape of the Surf handle creates a delicate motif that almost disappears beneath the worktop. The cabinet door is lowered to allow sufficient space for the handle and allow a perfect grip. 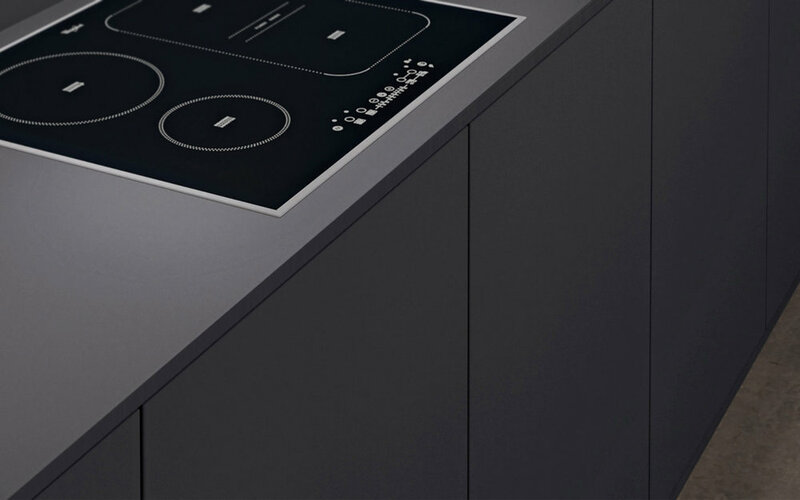 The aluminium finishing enhances the sense of movement created by the handle. Without any profile grips or handles, the Push-Pull opening system enables minimalist compositions to be created for a completely seamless design. Push-Pull openings can be applied on all types of base, wall or tall units. They can even be installed in the fridge housing unit, providing an easy opening system activated electrically just by touching the door. 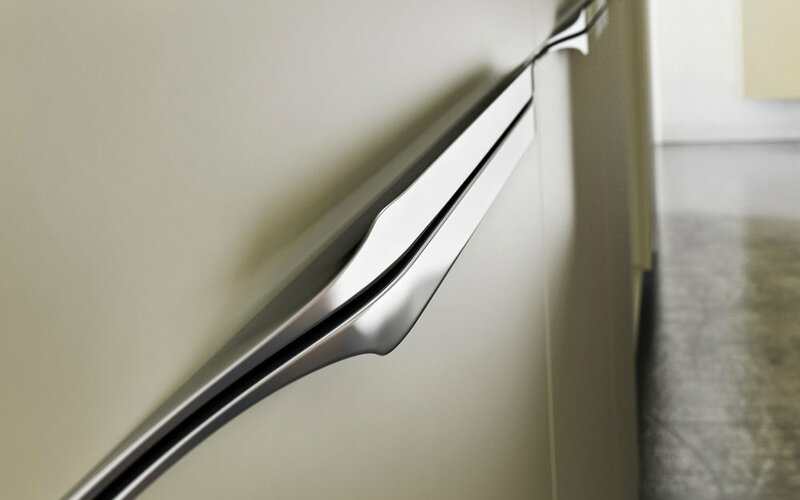 Since handles have a timeless appeal, Armony offers an array of 28 different handle designs available in a variety of finishings ranging from matt white through to black, aluminium and stainless steel. Want more? 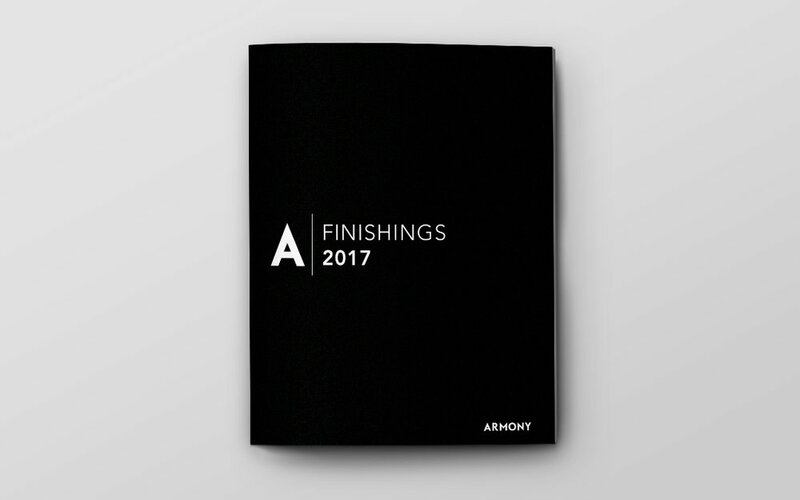 Click to download the finishing catalog!